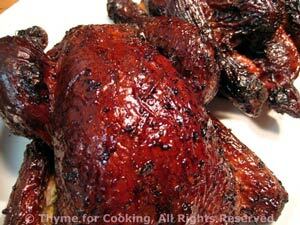 Thyme for Cooking Menus: Grilled Cornish Hens, Molasses Glaze, easy recipes. You can use commercial pesto... Unless you are one of the lucky ones with access to lots of basil - both are on the Shopping List. The combination of molasses, vinegar and soy sauce gives the chicken a flavor reminiscent of Peking Duck and leaves the crisp skin a lovely mahogany color. Mix all remaining ingredients together in a small saucepan. Heat to boiling and simmer for 1 minute. Cook hens on barbecue grill over indirect heat, covered, for 45 - 60 minutes or until done. Brush with the glaze immediately and 3 or 4 more times while cooking. Chicken is done at 160 F (70C) on your meat thermometer and/or the juices run clear when pierced with knife. Or they can be baked in a shallow roasting pan in a 400F oven for the same amount of time - until done, basting the same. When done, remove from heat, cut string and serve - don't forget finger bowls (it's messy) and bone bowls (to keep your plates tidy). Serve whole or cut each bird in half. Note: One would probably be enough for 2 people if it is on the larger side... Or you can substitute your favorite chicken pieces for the hens. Pesto is not just for pasta! 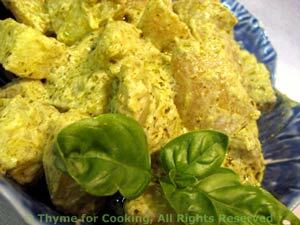 A spoonful in this or that adds a depth of summery basil flavor. Or use a lot, for this creamy potato salad. As usual, we try to keep the calories and fat down by using yogurt rather than mayonnaise. 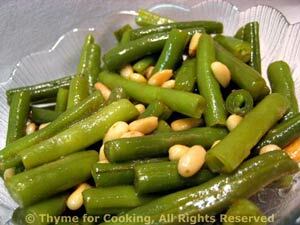 Cook in boiling, salted water, partially covered, until done, 10 - 12 minutes. When done, drain and put into serving dish. Mix pesto and yogurt. Add to potatoes and stir gently to coat. Serve. Put everything but the oil in a blender. Add 1/2 cup oil and blend. Add more oil as needed. It really depends on how tightly you packed the basil. I used 1 cup of oil. It will keep about a week in the refrigerator, up to 9 months in the freezer.